Look, I’ve watched many Spider-Man movies in my time. From The Amazing Spider-Man, to the more recent Spider-Man: Homecoming (and everything before and after and in between), it’s safe to say I’ve had my fair share of Peter Parker over the years. He’s a character I’ve grown up with, a pinnacle part of my childhood; a character that I’ve come to be attached to, even if I’m not quite out on Twitter tracking down spoilers for the upcoming Marvel movie or over analyzing clues from previous ones. 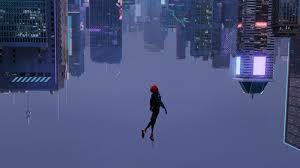 And so, with that I’ll say, no matter how much I love the live action films and the Spider-Men Tobey Maguire, Andrew Garfield, and Tom Holland gifted us, take Peter Parker’s advice and take a leap of faith; watch Spider-Man: Into the Spider-Verse. This movie is a force to be reckoned with. It follows teenager Miles Morales, an Afro-Latino kid from the Brooklyn, through his journey in becoming the next Spider-Man (in this universe). One thing to note is that this is a multiverse movie, so there are various different spider-peoples/animals that’ll pop up throughout the film. It’s action-packed, with every moment serving a purpose no matter how much or how little was really happening up on screen; and despite there being moments that could have caused the movie to drag, Miles, Spider-Man, Spider-Woman, Spider-Man Noir, Peni Parker, and Spider-Ham (all the different spider-men/women/pigs. Don’t ask. Watch the movie) makes it very difficult to feel bored at all.